Richard Quintain is an agent for the British Secret Service. At least he is for some of the adventures detailed in the numerous books about him. He is also an operative with counter-intelligence during WWII, assigned to find those spying on the British war effort. And apparently he is also an insurance investigator in one or two books. Quintain thus is whatever the reader wants him to be. Certainly he was that for the author. The fact that all the books were released around the same short period must have confused the readership some as forty years later it confuses this collector. Quintain is in his mid-to-late thirties during the Second World War. He is an operative working with the OSS (apparently) specializing in catching enemy spies infiltrating the armed forces. He is with the Navy sailing in a convoy, in France with the resistance, in Italy as the war ends, and undercover in Berlin as the Soviet march in. Like most good operatives, he prefers to work alone but can take part in a team if forced. He holds the rank of Lieutenant-Colonel in Military Intelligence. Twenty years later, storyline time but released both before and after the other books, Quintain appears to be in his mid-to-late thirties working for the British during the early to mid stages of the Vietnam War. He is also in North Africa going against Russian and Chinese spies. In four of the spy adventures set during this period, Quintain takes his orders from a spymaster named Fenner, a man that Quintain admires greatly, willing to risk his own life to free his boss from Soviet captures in one story. In the last book of this period, Fenner has been replaced with a man that Quintain frankly despises, making taking orders harder than ever. And at the same time as the modern spy tales, Quintain is also depicted as an insurance investigator handling international cases with ease and daring, taking the assignments lesser men would not dare. He occasionally operates in the States though he never loses his British roots. Whether he is in Europe or North America, acting for insurance companies or as a gumshoe, he still risks his neck battling mobsters, helping damsels in distress, and confounding the police on occasion. 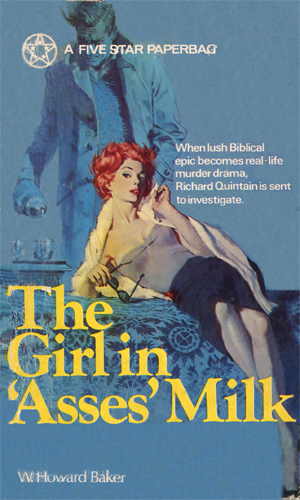 In more than one of these tales he is joined by the beautiful and resourceful Julia Wellsley, an operative/secretary who comprises all of the 'associates' in the Richard Quintain Associates investigative agency. 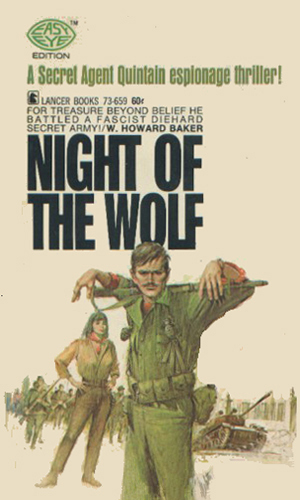 The author of the Quintain books, W. Howard Baker, was for over a decade before he created the versatile operative, an experienced author who had been given the chance to resurrect for print the famous Sexton Blake series which had produced hundreds of dime novels, pulp fiction, and later paperbacks. Baker was not just the editor, though. He used numerous pennames, including his own name, as he created a large number of the newer version of Blake, making him a modern private eye ala Chandler. While these new adventures were well received, their popularity was short-lived. By the end of the 50’s the Blake period ended. 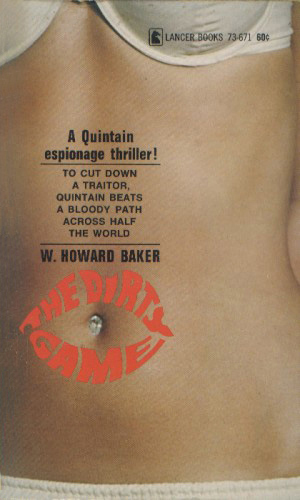 The author-editor Baker, however, was not done and he came up with a new and interesting replacement to Sexton Blake, the intense man-of-the-world Richard Quintain. Furthermore, he had a nice collection of Blake manuscripts he had penned himself and a need for interesting storylines. The former fed the latter. With clever reworking and changing of names and places, many of the Blake stories from years before became Quintain tales. It is probable that not all of the books released in the Quintain line were re-worked Blakes but enough were to establish a pattern. This does not explain away, however, why the huge disparity in timelines and in professions. Just about any author who has written a large number of stories about the same character will make an occasional contradiction. Baker’s use of the same character in different decades and doing different jobs in the same time frame is unique. Other authors have had their character change. Honey West went from a detective to a spy. Milo March was an insurance investigator who occasionally took a spy gig as part of his practice. David Danning did the same though he worked as a lawyer. And Ed Noon went from being a private eye to being the President’s private eye and back again but at least he was always a private eye. But Baker did not seem too worried about consistency. If he wanted to write a WWII drama and needed a rugged hero, Quintain was the name. If he wanted a hard-boiled detective to save a moll and crack a skull, Quintain was the name. 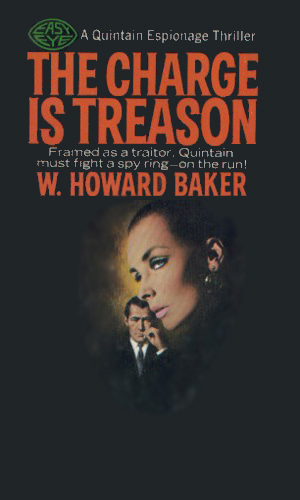 If he wanted a secret agent working for the government against Commies and other terrors, Quintain was the name. In one book, written when stories of the occult were just getting popular, the author needed a man dedicated to fighting black magic wherever it was practiced and Quintain was the name. One amusing aspect to what amounted to multiple heroes having the same name is that fact that Baker wrote most of them under his own name but released a couple as W. A. Ballinger and at least two as Bill Rekab. At least he did change somebody’s name. Note: included in this listing of books is the 0th one, Treason By Truth, written before any of the others. It is here because the character, a spy, is almost indistinguishable from the Richard Quintain character. He goes by the totally different name of Richard Costain. [Spy] Richard Costain of Military Intelligence and the Home Office is brought in when a NATO investigator is murdered right after learning of some upcoming event to disrupt the security of the West. [Insurance Investigator] Gail Turner was a beautiful woman set to marry into a very wealthy family when someone blew half her face away. The lead suspect was the man she had married years before. Richard Quintain is that man's only chance to stay out of death row. [Insurance Investigator] The local Mob was certain that Billy Wade had taken something worth 50,000 pounds. They want it back. Richard Quintain is also looking into the theft and he is likely Wade's only hope. Book 1 of the Quintain Strikes Back omnibus. Possible rewrite of the Sexton Blake story The Reluctant Gunman. [Insurance Investigator] Finding an injured woman on a back road, Richard Quintain took her to the first place he found with a phone. It may well have been the home of her would-be killer, someone who wasted no time in finishing the job. Now Quintain is mad. Book 2 of the Quintain Strikes Back omnibus. 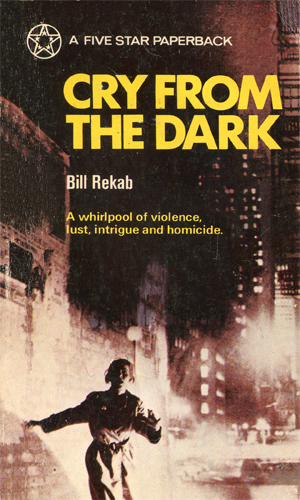 Possible rewrite of the Sexton Blake story A Cry in the Night. [Insurance Investigator] Theodora was a beautiful woman running from international criminals who wanted a missing relic worth millions. Private Eye Tupper was the man she turned to for help and he turned to his friend, Richard Quintain, because the chips were truly down. [Spy - WWII] During the Second World War, a convoy is trying to get through the Arctic waters to provide needed supplies but among the ships is a traitor giving positions to the enemy. 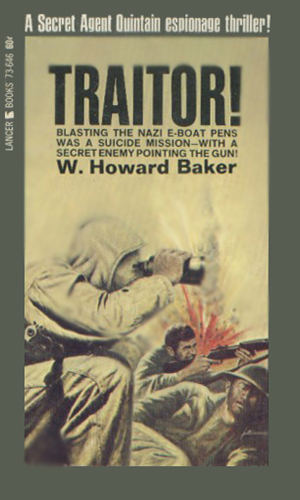 Richard Quintain must find the agent before the German U-Boats attack. Possible rewrite of the Sexton Blake story The Sea Tigers. [Spy - WWII] Taking place in 1942 in occupied France, Richard Quintain is working with a small group of demoralized partisons trying to stop a Panzer advancement. And somewhere in the group is a double-agent, telling the Germans their every move. [Spy - WWII] Even as the Soviets take Berlin in April 1945 and begin a period of pillage and worse, Richard Quintain is sent to the German capital to find the blueprints for the third generation of V rockets before the Communists get them. 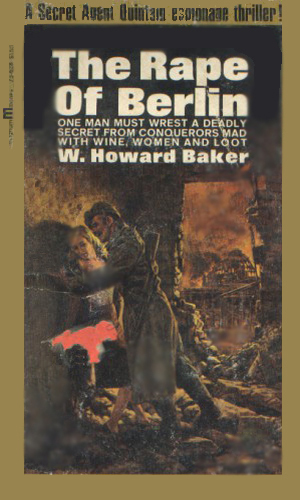 Possible rewrite of the Sexton Blake story The Last Days of Berlin. [Insurance Investigator] Richard Quintain and his associate, Julia, learn of a plot to take over the world using the arcane power of Voodoo. 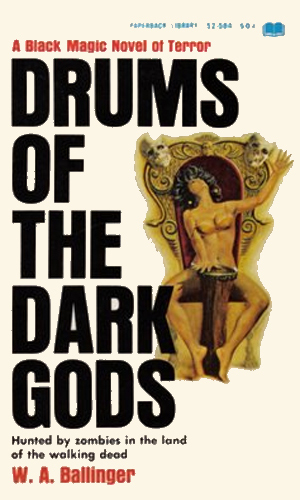 Being sworn enemies of the black arts practitioners, they head to Haiti to bring the plotters down. [Spy] A major player in NATO's intelligence field, a man who knows far too much, has been taken prisoner by the Russians along the border with Hungary. It is the task of Richard Quintain and one other to go deep into Russia to get him out. [Spy - WWII] Richard Quintain is in Italy in early 1945 as the partisans catch and hang Il Duce. His mission is to find and safeguard a horde of gold desired by those who would buy a resurgence of Fascism. His biggest adversary is a man of considerable reputation who calls himself the Wolf. [Spy] Angela Geddes is in Vietnam to find the people who killed her husband and is willing to use, or abuse, anyone to that end, She falls into company with the sinister Mr. Huang and needs help whether she knows it or not. Richard Quintain is in country to track down a security leak and is the only one who can help her. 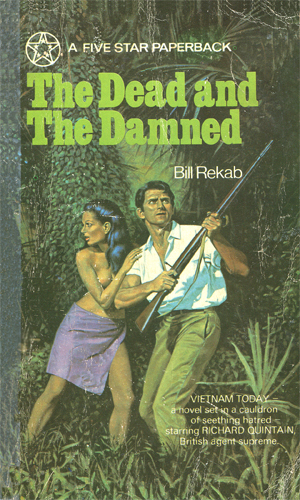 Possible rewrite of the Sexton Blake story Woman Of Saigon. [Spy] In Tangier, a city known for its popularity with espionage agents, Richard Quintain is ordered to discover who among an impressive list is double-crossing British Intelligence and eliminate him. Or her. The Russians and Chinese agents there don't like his goal. Possible rewrite of the Sexton Blake story The Violent Hours. 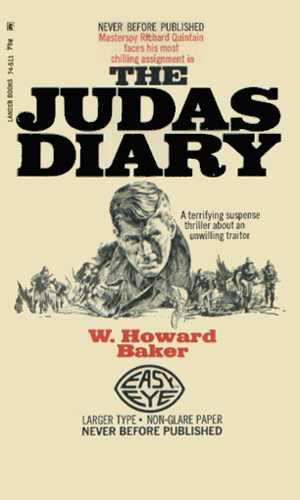 [Spy] A reporter in the war-zone of Vietnam is suspected of being a double agent and Richard Quintain is sent into the turmoil to find and eliminate him. But is the journalist just a pawn? 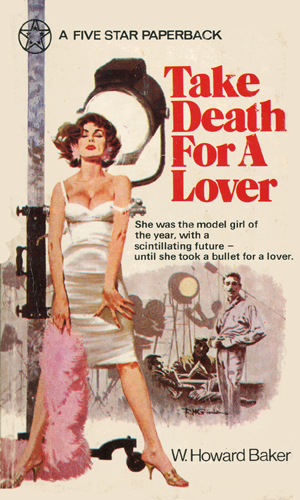 [Insurance Investigator] A beautiful actress is clawed to death on the set of a movie involving a large number of wild animals. Richard Quintain is hired to find out if the death was a horrible accident or deliberate murder. Possible rewrite of the Sexton Blake story Studio One Murder. [Spy] The new boss at the agency doesn't care for Richard Quintain or his methods, so the experienced agent finds himself reduced to errand boy. And then comes word that he is being investigated for treason and a contract is out for him. [Insurance Investigator] On a fishing vacation to Ireland, Richard Quintain had not planned on becoming involved in a 400-year old murder mystery but when fresh bodies show up, he decides he cannot stay out of it. Possible rewrite of the Sexton Blake story Terror Loch. The Quintain series is a mess if continuity is important to the reader. The order that I have given the books is based solely on the copyright year and not on any particular sequence that makes sense. Since the author did not appear to worry about such things as what happened when, neither did I. 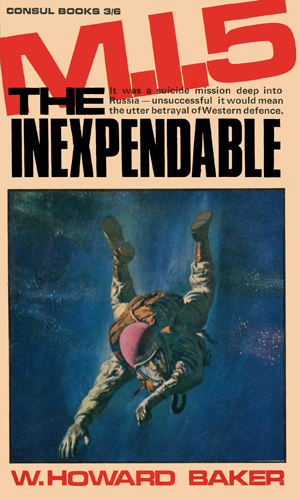 If an order is desired, it might be to read the four WWII-era spy novels, then the five 'modern' era spy novels, and finally the seven adventures about his days as an insurance investigator. The amusement about the variety of professions notwithstanding, one fact is a constant throughout all stories. W. Howard Baker knew how to tell a tale. Each story by itself is darned good adventuring and well worth reading. Quick action, easy to recognize characters, spiffy dialogue, and tight plotting were his stock in trade and he never failed to give the reader a fun fast ride. There is no doubt to me that the author decided every hero would be Quintain, a truly Renaissance man. Whether he is an insurance investigator or a secret agent does not matter. Whether he is active during or far after the Second World War is immaterial. Quintain is the man for the action. I like these, but then I liked most of them when they we Sexton Blake stories, too! Baker wasn't the first to de-Blake old books - many of the pre-war authors did this - but he was the first to make an industry out of it. 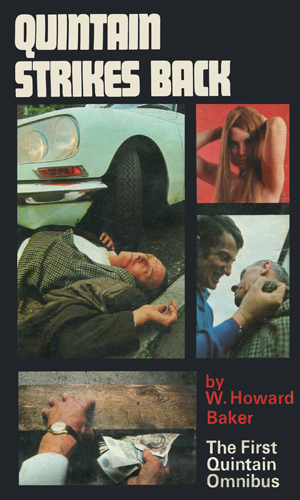 There is one other 'Ricky Costain' book I know of - Scandal Street. This was a Blake that was withdrawn at the last minute and substituted, allegedly because of its violent content. Having read it, I suspect it may really have been because the press baron depicted less than flatteringly within its pages was a little too like the owner of Fleetway, the Blake publisher. 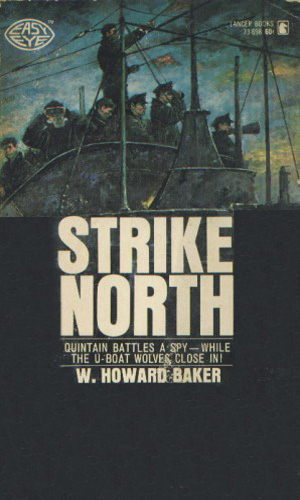 Most Quintains (the name was adopted when a full publishing scheme was formed by Press Editorial after cessation of the Blakes by Fleetway in 1963, which is probably why the earlier two books are 'Costain')were by Baker, but Wilfred MacNeilly also used the WA Ballinger name and some are his work. 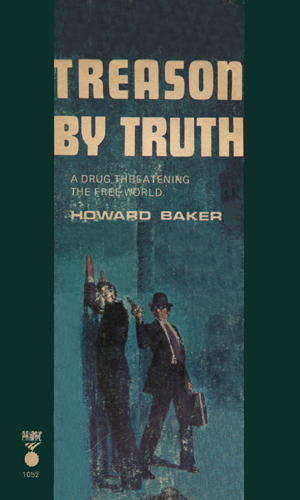 Post-WWII Blake was set cntemporary to writing and also harked back: regular Blake readers knew the history and had a generous suspension of disbelief when time frames changed. This didn't jar with them, but it does admittedly look odd when applied to a series that has no stand-alone history or backstory!